For the past few days, I have had a horrible sinking feeling that I have been unable to shake. I actually thought that something was going to go wrong with the goats. It got to the point that I confided in Sean that I have him turn on the lights and check the stalls each morning before me because I am afraid of what I will find. It is an unfounded fear and irrational, but perhaps understandable in the wake of Sapphira and Pepper's shocking deaths last month. Sean assured me that everything was fine and it was. I still couldn't shake this feeling. Sean and I discussed how to arrange our schedules to maximize the amount of time one of us was home through April, so when the new kids came, we would be there. Leah miscarried last year, but Rachel had never been bred. Being new "Mommas-to-Be," Sean and I wanted to be present to assist in any way we could- even if the Momma is doing all the hard work. By my calculations, Rachel and Leah were not due for another month. Rachel had just began to "bag up" (fill her udder), but Leah looked no where near ready. They were not exhibiting any signs of imminent delivery; no change in their regular behavior that we discerned, no discharge of mucus, and they were both still relatively small- nothing like the ungainly mass Miss Ruby attained to before her delivery. I had to work an event for my regular job, which was going to take me from home for about 4 hours, but Sean and his game night friends were hanging out at our house after Sean got home from his work in the evening. Normally, Sean will check everyone and give their evening feed and water when he gets home at 5 pm. Wanting to tidy the house before his friends arrived, he thought to delay that until I got home at 6 pm. 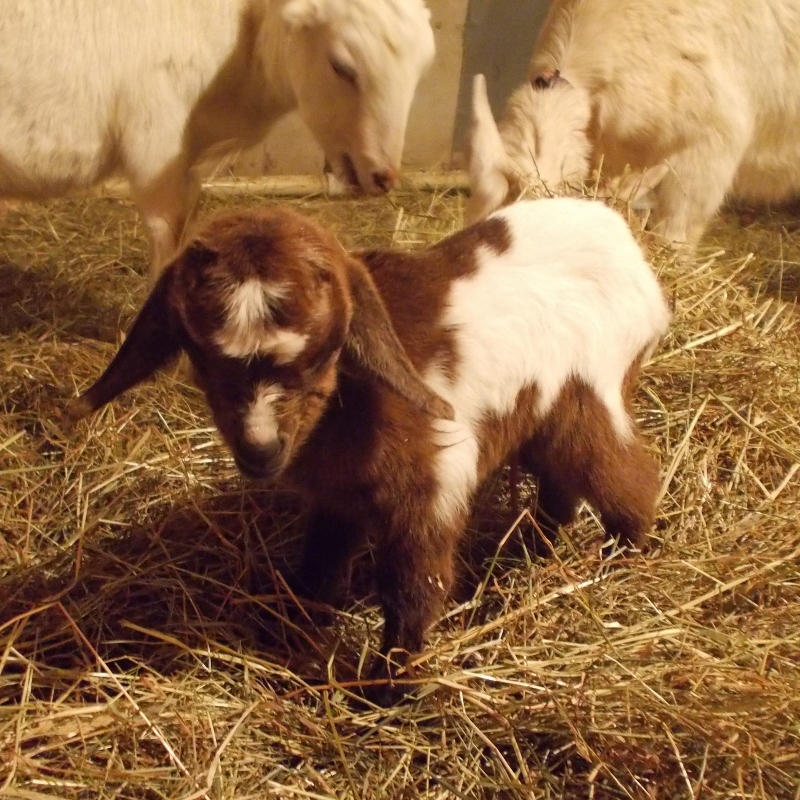 Hands full of brief case and pizzas, I heard the goats all calling in the stall as I walked inside. 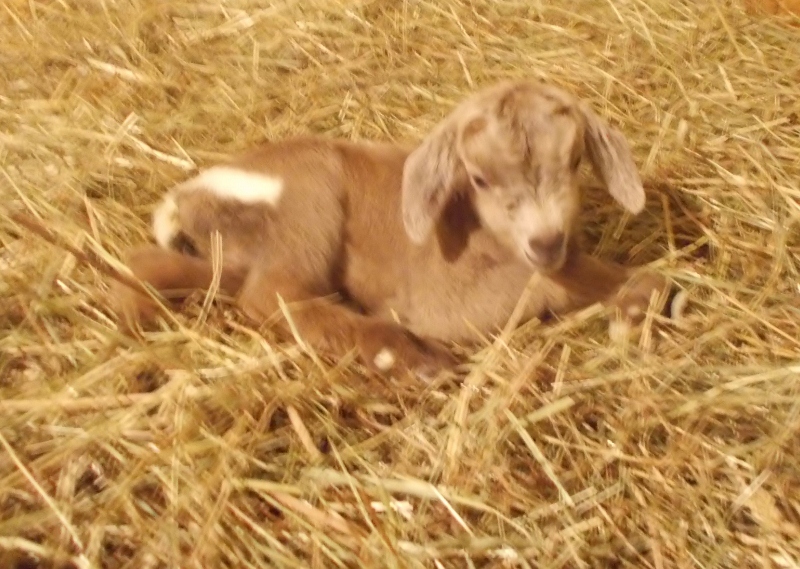 While I got dinner settled for the guys, I asked Sean to check on the goats and put everyone to bed for the night. Not 5 minutes later, Sean returned inside with 2 wet, cold, and very clearly newly-birthed kids. I grabbed towels from our vet bag and wrapped the kids in them and headed to the bathroom to get them clean and dry. Sean returned to the barn to see who had kidded and get her moved into the basement kidding stall. My job was to get those kids warm immediately. I laid one on the floor, wrapped in a towel and began to wash off the other with warm water and a clean cloth. It only took a few minutes to clean the first kid up. A quick check to see it was a "him" and then, he was bundled into clean dry towel and given to Seth (one of Sean's friends) to hold near the wood stove to warm up further. Sean returned inside with both Rachel and Leah. Both of them had red and bloody tail ends, made more obvious by their white coats. Rachel had a stringy glob of placenta hanging from hers. At this point, we were unsure whether they were both in the process of kidding or if they each already had. Sean carried them into the basement and returned with some grain, fresh hay and molasses laced water for them. Our does always want to eat and drink while they are in labor and after they are delivered. Having delivered 4 human children, I was always more interested in a warm shower and some sleepy time after having my babies, but I am not about to argue that with our does. They want a bale of hay, an extra half ration of grain and buckets of water? Then, THAT is exactly what they shall have! While Sean was settling in the does, I took 5 minutes to wash off and dry kid number 2. She was very cold and limp. She did not bleat at all while I cleaned her. This sent up a red flag, but getting her clean, warm, and dry was my first priority. I was hoping the handling of her, the drying and the warming, would perk her up. It did, but she was still not as active as the other kid. I brought both kids to the basement to be with their Mom or Moms. How would we know who belonged to whom? We hoped they would know. Thankfully, they did. Leah responded to the buck's calls with licking and allowing him to suckle. Rachel was interested in the doe's cries, but would not allow her to nurse. Rachel licked the doe kid head to tail, but moved away when the doe tried to latch on. Ruby acted similarly after she birthed Hadassah, not wanting to nurse until she'd delivered both her kids. So, though I was a little worried, I was not overly concerned about it. I thought that perhaps Rachel had another kid to deliver or maybe she was just new to this whole thing and needed some time to figure it out. 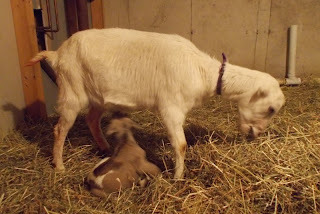 I was encouraged that Rachel was protective of the doe, even if she wouldn't nurse yet. I spent 3 hours with the goats, clearing soiled hay, watching them interact with their young, and taking pictures. I made certain that the does' udders were clear and their precious colostrum was available. I attempted to help the doe kid to latch on, but she both she and Rachel were disinclined to nurse. Rachel passed the placenta and I disposed of it. I suspect Leah had already delivered hers in the barn and disposed of it herself. No other kids were born. I remained a little anxious that our doe was standing stiffly and not moving about like the buck was. I checked her tail and cleared some meconium (the first tar-black, sticky waste). But, I decided that since there did not appear to be anything physically wrong with her, I would give them some time to settle in and re-assess things in another hour. It was nearly 9 pm, I was covered in yuck and more than ready for my own (now cold) dinner, too. We needed some names for these new ones. We decided to name Leah's lad, Judah. And, Rachel's lass, Keren. Judah was the name of one of the Biblical Leah's sons. Keren is the shortened form of Job's lovely daughter, Ke'ren Hap'puch. We checked the does at 10 pm. Leah and Judah were settled in just fine. Rachel was laying down, resting, but she was not laying closely with Keren. Keren was cold to Sean's touch, especially her hind legs and stomach. Sean brought Keren upstairs with him and we discussed whether we might need to bottle feed her. If we did, at least, we would have a plentiful supply of milk handy. That was a last resort, though. We believe that animals thrive best when they are allowed to live the way they were created to. We bottle feed as a last resort. Other farmers have their own philosophies and practices, but this is how we do it. It was late and we were all tired. I hoped that Keren was just tuckered out from being born and that once she was rested and warmed thoroughly, she would do better. I could not keep my eyes open for another minute, so Keren came to bed with us. Trying to infuse my warmth into her, I snuggled Keren unto the crook of my left arm, wrapped my knees around her tail end in the form of a "comma", and we all went to sleep. Drifting off into the "half" sleep that many parents develop, I remembered holding my own children so, when they were newborn infants. I cannot say I slept well. First of all, I am fighting a sinus infection, which makes my breathing labored. Secondly, I was mindful of not rolling over, nor releasing my protective arm from around Keren. And, without a diaper for protection, I was mentally prepared to move quickly, should the need arise. Around 1 am, Keren stirred and began to "meeeeh" softly. I woke Sean and asked him to bring her to her mom to see if Rachel would respond. A few minutes passed until Sean returned kid-less back to bed. When the does heard Keren's cries, all 3 mothers woke and stood. This aroused all the kids, who simultaneously began to nurse- including Rachel and Keren. 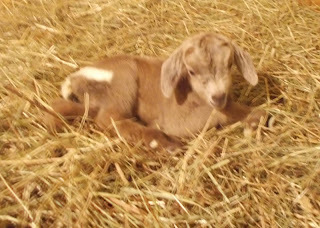 This morning, when we checked them again, everyone was behaving normally, nursing with vigor, and doing well. What a relief! I spliced together this video for you from the footage I captured last night. Thanks for visiting with us today, friends. We are glad you are here. Wonderful story and video! Thanks for posting!! 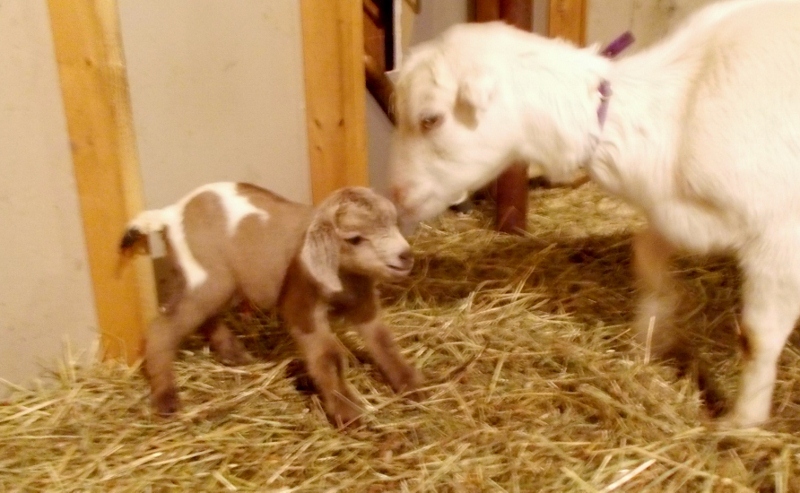 such a good surrogate goat-mommy you are!! They are adorable - I am particularly fond of Keren - just plain cute. So glad all went well, especially after all your nervous days preceding the kidding. Best wishes to you and them! Hey Sonja! I am so excited for your newest additions. What is your email address so I can send you my address? I got your address, KellyAnn. You prize is on its way! 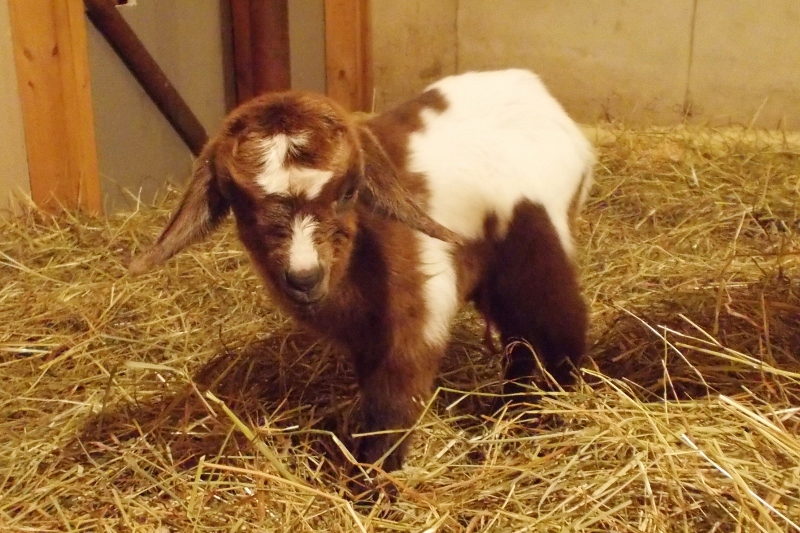 You got to sleep with a baby goat? Oh man, I am so jealous! Congratulations - so wonderful to see mamas and babies doing well!